Looking for the best tips on saving money for Christmas? Christmas spending can sometimes turn even the jolliest person into a Scrooge. How many of us plan to do Christmas saving throughout the year? Then come November we realize it’s too late and we reach for the almighty credit card? Sure it may make the kids happy but now you’re starting your new year deeper in debt. Repeat the cycle the next holiday season and it’s no wonder our country has a massive debt problem! Or we wait until the last minute for purchases and overpay compared to what we could have spent if we had planned ahead. Christmas is supposed to be a time of joy; of giving, of family, of love and great meals shared with loved ones. 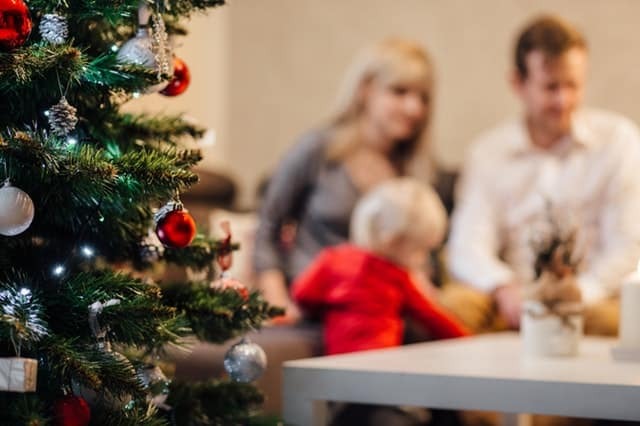 The good news is that with just a few minor tweaks in your planning throughout the year, you can have the Christmas of your dreams without the dread of huge credit card bills hitting in January. In this post, we’re looking all the top Christmas and holiday spending statistics. We’ll discuss how much you should spend on your kid’s presents. And we’ll also talk about some of the easy-to-forget expenses that can creep up on us. And we’ll talk about the best strategies on saving money on the purchases you know you’ll make. Specifically, though, we’re looking at the best tips on saving money for Christmas so you can truly enjoy the holiday season. If your family does ANY holiday gift giving in December these saving money for Christmas strategies can still apply and will help your family. Want an easy and cheap way to spend less the rest of the year so you have more for the holidays? What is the average Christmas budget? 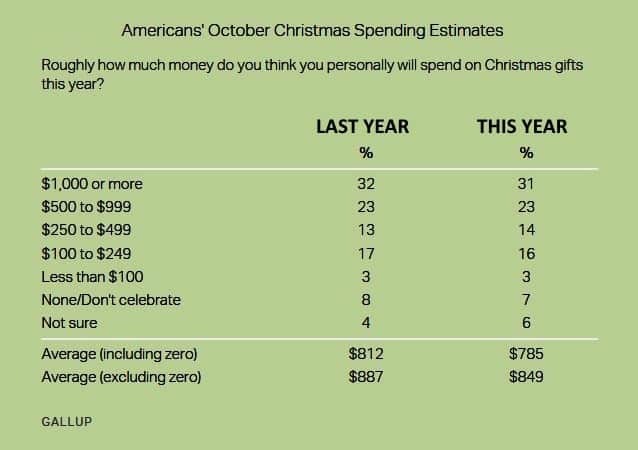 According to Gallup, one of the long-standing premier polling companies in the US, the “average” American family will spend $785 on Christmas this year. This is consistent with previous years, but down quite a bit from the all-time high of $909 in 2007. You can see more statistics on Christmas spending on their chart, which shows that while the average that will spend $785 this year, the majority of families actually spend $1000 or more. What is a Christmas account? I go deeper into why you not only need a Christmas club savings account but also 4 other bank accounts in a previous post about why you need 5 Bank Accounts and not just checking and savings. If you’re going to do Christmas saving right, it’s essential you check out that post for more detail. A Christmas club savings account sometimes called a Christmas Club, is simply a bank account that is specific for saving money for Christmas. This program came into effect during the great depression. Essentially you set money aside every month (or week) into this special savings account. Then in November as it approaches the holiday season, the bank automatically transfers it back into your checking account. Trust me, it makes saving money for Christmas easy! Do banks still have Christmas Clubs? The short answer is yes; many still offer a Christmas club savings account for saving money for Christmas. My credit union does and that’s what my family uses. But according to the Credit Union National Association (CUNA), only 9% of people in America use a Christmas club savings account. They go on to say that about 72% of credit unions still offer them. While some banks also offer them, the credit union is the king of the Christmas club savings account. So if your bank doesn’t offer one, take a look at your local credit unions. They likely offer that, along with the personal service that can come with not being a huge multi-national industry. How can I save money for Christmas presents? One of the keys to doing saving money for Christmas, no matter how much you spend, is to start saving for it months in advance; ideally in January. According to the Statistica, in a recent study, they found that upwards of 66% of people did not save anything for Christmas spending. In looking specifically at European countries, The Czech Republic dominated, followed closely by the United Kingdom. But even then, the highest percentage that did Christmas saving was only 35%! So if you’re in that boat, don’t feel bad; you’re in good company! But I do want to make some suggestions that will set your family up for future financial success! The amount your family spends may vary and that’s OK! You don’t need to spend a fortune, go into debt, or wreck your family’s finances to make your kids happy. 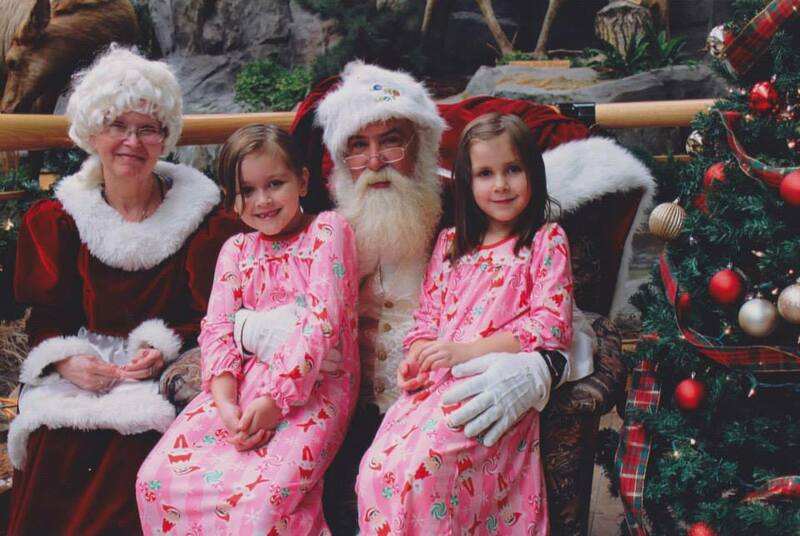 When your kids see you saving and spending wisely (and if they still believe in Santa as my kids do, this lesson will come later) you are setting them up for future financial success and ensuring they will win with money! How much money should you spend on Christmas? Dave Ramsey himself was asked how much he recommends saving money for Christmas. The average household income was around $50,000. If you make $25,000, then you would be half of average, and your whole Christmas budget should be about half of the average, or about $400. He goes on to say “I’m always of the opinion the adults can fend for themselves. In case of a budget crisis, we should only take care of the children.” I would agree with all of his opinions, wholeheartedly, but then I am a big Dave Ramsey fan! Hear Dave answer this question on Christmas spending right here! One thing that’s important to remember is that it’s not the amount of money you spend on Christmas that makes it special. Now if you’ve spoiled your kids the last few years to the degree that they now behave like Dudley from the Harry Potter series, you’re going to need more than this blog to turn it around. But I am convinced that any parenting oversights (and we all make them) can be fixed. Simply being aware of the issues and being intentional and honest about them (with yourselves and your kids) is half the battle. What do kids want most for Christmas? They want you and your spouse connected. They want harmony and love in the house. And if you don’t always have that (been there, done that), then working on that is the greatest Christmas gift you can give to your family. Kids aren’t complex creatures. As we age and encounter life, the inevitable challenges & disappointments come in more and more. We naturally get more complex with our emotions. But at a young age, our needs are simple. The other sad reality of Christmas spending is that MANY families go into debt to do it! In a recent survey by a company called creditdonkey.com, they found that on average, about 37% of families use credit cards to pay for Christmas spending. I don’t advocate the use of credit cards at all and don’t actually have any in our house. But I get our way of doing things may not be your way. That’s OK! But I do want you to think about the choices you make regarding debt. I want you to be intentional instead of just reaching for them out of desperation. Need to spend more than you have? Rather than go into debt, why not check out one of my most popular posts about 53 Ways to Earn Extra Money on the side? Many don’t even require you to leave your house! Let’s look at how debt robs you of your Christmas cheer! Statistics courtesy of ValuePenguin. Credit Card interest figures courtesy of Bankrate.com’s calculator. So if you charge an additional $800 on top of the likely $6,000 you already have, your average minimum monthly payment could be as high as $442. 81 months is almost 7 years! In that 7 years, you will not only repay the original $6,800 you borrowed but an additional $1,724 in interest! Putting aside the amount you charged, just investing that $1,724 instead of paying it for the privilege of borrowing money could earn you upwards of $3,359! (factored using an average of 10% growth over 7 years – compound interest calculator courtesy of moneychimp.com). You would almost double your money! Of course, interest rates vary and are not guaranteed, so your actual results could be different – my point is to get you to realize just how bad an idea it is to use credit cards and what taking the same money and using it in a different way could do for you and your family! Imagine what you could do with an extra $3,359! The key here is budgeting. A written budget you write out and stick to before the month begins. You want to know exactly where all of your hard earned dollars are going, even if you don’t have a lot of them. Once you begin to use a budget you’ll quickly identify if you have a spending problem, an income problem or are simply living beyond your means. If you still struggle with trying to budgeting money on a low income, check out one of my most popular personal finance posts to give you more actionable tips to get back on track! Not on a written monthly household budget? It’s essential for the financial future of your family and essential for your saving money for Christmas. 13 Proven Saving Money for Christmas Tips You Probably Don’t Know? If you make under $100,000 gross household income but over $60,000, somewhere around $800 to $1,200 is about right. Are you doing any holiday charity donations? Each year, we sponsor a foster child’s Santa list for about $100. Make sure to budget for that too. Make sure you are doing a written household budget every month before the month begins and that you budget in your Christmas spending money so you aren’t scrambling each month to come up with it! If you just leave it in your checking account it’s almost guaranteed you will find a way to spend it! The best part about a Christmas club savings account is that you don’t have to think about it! It makes saving money for Christmas easy! If you are traveling for the holidays, you can generally find the best deals on hotels & rental cars when you book at least 8 weeks out. Check out all the best deals on holiday travel on TripAdvisor. 8. Check to see if you can housesit at your destination and skip the hotel expense! Housecarers is a worldwide company that matches people looking for a housesitter with people just like you! There was one Christmas where I was almost totally broke. You know what I did? I bought a case of mason jars, got out my pots and pans and made homemade salsa & pasta sauce and canned them up. Add a cool little label I made on my computer and printed on stickers and wa-la! Instant inexpensive Christmas gifts! You know what those gifts had that no store-bought gifts could ever have? My love, care and personality and, literally, my flavor. Family and friends mostly just want you and to connect with you, so don’t stress over budgets; just put down your phone and spend some time connecting and being present to your loved ones. Trust me; that’s the greatest gift you can give them! See my example above about how simply not charging your Christmas spending to credit cards could help put an extra $3k in your pocket! Then consider getting rid of expensive cable TV and get the top-rated digital antenna from Amazon for under 30 bucks, or get a Roku stick and stream Amazon Prime, Netflix, Hulu, and other similar channels. Don’t have Amazon Prime? It’s got tons of channels, movies, and TV shows. Try Amazon Prime free for 30 days! You’ll also get their famous free 2-day shipping on all qualified purchases. Those “unintended purchases” are where they make their money, but it can blow your saving money for Christmas strategy! Make a list of all the presents you intend to purchase and stick to the list! 13. Buy presents throughout the year to save big! Did I cover all the saving money for Christmas tips you were looking for? In this post, we took an in-depth look into the world of Christmas and other holiday spending. We looked at averages and statistics and the most common spending patterns and habits of families. We not only talked about ways to save for Christmas so you don’t go into debt, but we also talked about strategies for saving on the things you buy. Specifically, though, we looked at the best ways of saving money for Christmas so you aren’t stressed over bills or debt and you can actually enjoy the holiday season. The app Trim automatically looks at your monthly bills & spending and then cross-checks that with savings programs almost all vendors have. It’s a great way to put a few extra bucks in the bank each month for your Christmas savings account! How does your family do holiday spending? If you like this post, please follow my Budgeting board on Pinterest for more great tips from myself and top parenting experts! That was a very good tip, particularly to those fresh to the blogosphere. Simple but very accurate info… Thank you for sharing this one. A must read article! Thanks for taking the time to comment Corina! Hey There. I discovered your blog the usage of msn. That is a really neatly written article. I will make sure to bookmark it and return to read extra of your helpful information. Thanks for the post. I will certainly comeback. Thanks for finding it and taking the time to comment! Thanks for taking the time to comment. I looked at dozens of themes and finally settled on this one as I liked the look and the name of the theme was the same name as my oldest daughter! Another thing I have really noticed is the fact that for many people, below-average credit is the response to circumstances outside of their control. Such as they may be actually saddled having an illness so that they have high bills going to collections. It would be due to a occupation loss or inability to go to work. Sometimes divorce can really send the finances in the wrong direction. Thanks for sharing your notions on this weblog. Hi! I would absolutely love you to share anything of mine you find interesting or relevant! I’d consider it an honor. Thanks for finding me and considering sharing! My web host does a regular hacking check of my site, but I also use the plugin Akismet to help protect against spam and I do daily backups so I’m never too far behind if I did get hacked and had to restore. Youre so cool! I dont suppose Ive read anything like this before. So good to seek out somebody with some original thoughts on this subject. realy thanks for beginning this up. this web site is one thing that is needed on the internet, somebody with somewhat originality. helpful job for bringing one thing new to the internet!